← What is the most controversial prophecy in the Hebrew Bible, and why read it at Passover? Just ponder the opener to the blog. 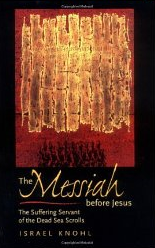 “The Messiah Before Jesus: The Suffering Servant of the Dead Sea Scrolls,” a fascinating book by Dr. Israel Knohl of Hebrew University. This is the week of Passover, the Feast of Unleavened Bread, and the Feast of First Fruits. Millions of Jews in Israel and around the world are celebrating the story of how the Jewish people were saved from the “angel of death” in ancient times if they put the blood of a perfect slain lamb on the doorposts of their homes in Egypt. This is also the week of Good Friday and Easter. Billions of Christians around the world are celebrating the death of Jesus of Nazareth, and His resurrection from the tomb three days later, and the belief that all mankind can be saved from the “angel of death” in our times if we, too, trust in the blood of a perfect slain Passover Lamb.